For his 50th college reunion, Terence T. Finn delivered a lively, 83-minute illustrated lecture on World War I.
Williams College, Williamstown, MA. June 2014. Terence T. Finn, a former senior executive at NASA, was a charter member of the agency's Space Station Task Force as well as Director of Policy and Plans for the Office of Space Flight. He also served as NASA's Director of Legislative Affairs. Prior to his NASA career, Finn held several staff positions on Capitol Hill including Staff Counsel for Energy, Natural Resources, and Science at the U.S. Senate Committee on the Budget. He was an Associate Fellow of the American Institute of Aeronautics and Astronautics, and, in an adjunct role, taught political science at American, Catholic, and George Washington Universities. A graduate of Williams College and the University of Sussex, he held a PhD in Government from Georgetown University. Retired to Chestertown, MD, Finn pursued a lifelong interest in British and American military history, and published four books. Terence T. Finn died in 2014. — Richard S. Tobey Jr.
"The knowledge summarized in this helpful little book will give you a fundamental understanding of America's 12 wars. It will, as it were, level the playing field among all 12. I found that I knew much more about the Civil War, the Revolution, World War II and the Vietnam War, that I did about the other eight. I was very happy to have a source that gave me a solid base on all of them." Advanced Placement and International Baccalaureate teacher, Fairfax County Public Schools. 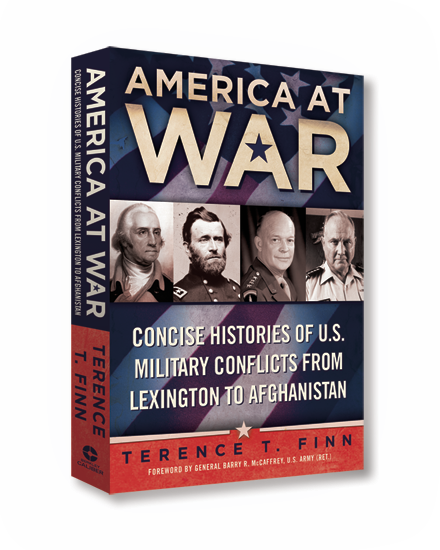 Author Terence T. Finn’s latest book presents the most succinct and precise history of why and how America has waged its wars since its birth. War — organized violence against an enemy of the state — seems part and parcel of the American journey. lndeed, the United States was established by means of violence as ordinary citizens from New Hampshire to Georgia answered George Washington's call to arms. Since then, war has become a staple of American history. ln this comprehensive collection, Terence T. Finn provides a set of narratives — each concise and readable — on the twelve major wars America has fought. He explains what happened, and why such places as Saratoga and Antietam, Manila Bay and Midway are important to an understanding of America's past. Readers will easily be able to brush up on their history and acquaint themselves with those individuals and events that have helped define the United States of America. History/Non-Fiction. Paperback, Penguin/Berkley/Caliber, January 2014. $17 US. This book is available for purchase through PayPal. © 2010, Terence T. Finn.